Development on a video game funded by the crowdsourced funding site Kickstarter has stopped as all its programmers have quit. More than 1,200 people backed Haunts: The Manse Macabre when it ran a funding campaign via Kickstarter in June 2012. It pledged to produce a horror game but that has been mothballed after running out of cash and staff. Experts said it could be first of many shelved and showed the perils inherent in the making of video games. Haunts sought $25,000 (£15,590) from Kickstarter but the project proved popular and meant the game's developers got $28,739 (£17,895) to fund completion of the game. Prior to the funding appeal Haunts creator Mob Rules Games had spent about $42,500 getting the basics of the title completed. The end result was supposed to be a haunted house horror game in which players could take on the role of the house's inhabitants or intruders investigating what lived within it. Now Mob Rules Games boss Rick Dakan has revealed that the game's development has prematurely halted. "The principal cause for our dire condition is that there are no longer any programmers working on the game," said Mr Dakan in a blogpost updating backers. Haunts' lead programmer was only contracted to work for Mob Rules for a year, said Mr Dakan, and having returned to Google has no spare time to keep working on the game. 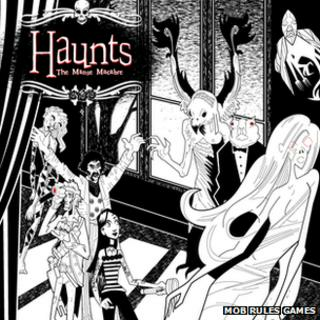 In addition, Mob Rules second lead programmer has quit and no longer wants to work on Haunts. Before the pair left, said Mr Dakan, they all but finished the game but it would need extensive bug testing and refinement before backers could get at it. Unfortunately Mob Rules has no-one available to do this work. In addition, Haunts has been written in the Go programming language which is not widely used and will limit its chances of hiring new hands to complete the work. "My obligation to all of you generous Kickstarter backers is foremost in my mind and I have not served you as well as I should have," he said. "Most people pledge at the level that promises them the final product, and so of course don't view their act as a philanthropic one, but as a purchase," he said. Funding problems, delays and disappearing developers were all problems that games studios had to weather, he said. "That's all part of games development, and now individuals are learning of the risks publishers take when they fund a project by the traditional models," he said. "It's a real shame to see Haunts struggling," he said. "They've done exactly what Kickstarter suggests - being open and frank about the issues they've faced, how they've spent the money, and their attempts to resolve them." Mr Dakan did add that zero developers, an obscure programming language and dwindling cash did not mean the game was entirely dead. He was in talks with another games studio that might take the title on and invited anyone who might be able to help to get in touch. "We're going to make this game, and if you can hang on for what looks to be a long road ahead, we will get it finished," he said.